← Write on- When is the old murder still new? “There’s rosemary, that’s for remembrance: pray you, love, remember. And there is pansies, that’s for thoughts.” Hamlet, Act IV. The pansies and the sweet peas are really doing their own thing this year in the city garden. Sometimes I feel so cruel snapping their heads off, but that’s how they keep reseeding for me. I just had to get this little chap in the vase and enjoy him. I love their scent. It’s delicate and sweet, perfect to sit next to whilst reading a good book, and you will never be overpowered by a strong scent like a lily can do. Lady Mary Elizabeth Bennet amassed every kind of heart’s-ease she could find. Just looking at the pansy with its cheery little face eases the burden of life. The name originated from Heart’s Ease and St Euphrasia as her name in Greek means cheerfulness of heart. Lady Bennet an avid collector of violas, began cross breeding her collection and in 1812 she introduced the pansy variety that is commonly found in today’s gardens. Shakespeare’s claim a rose is a rose by any other name is true for this sweet little flower. There’s, Three Faces under a Hood, Flame Flower, Jump Up, Flower of Love, Pink of my John, and I am sure that last one has an interesting story hiding somewhere. The little fellow often looks like some one deep in thought, and hence the name Pansy from the French Pensée meaning thought. Legend would have us believe that this little flower was originally snow-white, but when pierced by Cupid’s often cruel bow it turned a bright purple. 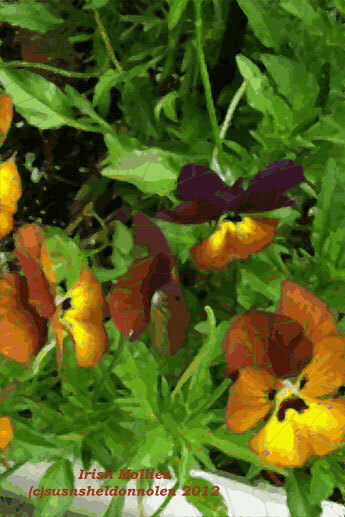 Can you see a loved one in the face of a pansy? I suppose, but most people I know don’t quite look like that! Carry this flower and it will ensure the love of your sweetheart.. Errgg not if they have allergies! Gallery | This entry was posted in Gardens and tagged Arts, Cupid, Elizabeth Bennet, England, Euphrasia, Flower, History, Pansy, Photography, Poetry, Sarah Doudney, Shakespeare, William Shakespeare. Bookmark the permalink. 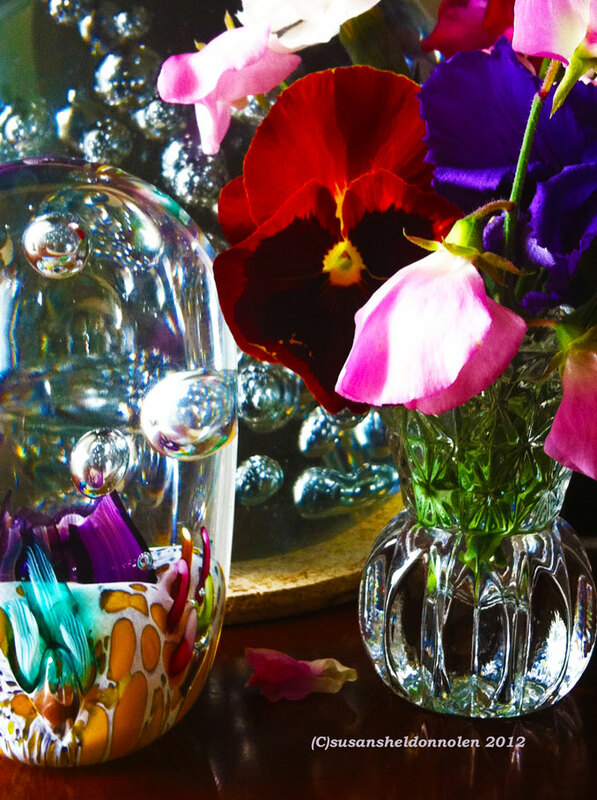 The vases are as pretty as the flowers…a truly complementary arrangement! Thanks for stopping by! I lucked out, the sun was just hitting the glassware! Looking forward to reading your blog! Lovely colors, Susan. Here, pansies grow in winter. Our summers are too hot for them. I guess we are lucky. As long as there isn’t a hard frost, they can bloom in the winter and all summer. I just love the little chaps!